The first objective of most any large wind turbine blade design project is to get to the lightest weight possible. At NASA Langley Research Center, where I helped develop the code that later became HyperSizer, designs for spacecraft that include composites also have a zero failure-tolerance. Those projects must strike a critical balance between low weight and high strength. The same is true in the wind-power industry. Weight is of tremendous importance when designing wind-turbine blades because a lighter blade uses less material, it is easier to manufacture and transport, and has lower fatigue loads. Engineers at Swiss-based composite manufacturer Gurit peeled back the layers on a generic design to show the complexity of a composite rotor blade. HyperSizer can be used to optimize the composite, structure, materials, and layup, resulting in the lightest, most durable design. Image courtesy of Gurit. With failure rates still high for turbine blades (a Sandia survey of wind energy plants documented rates as high as 20%) and down-time costly and bad for business, blade designers and manufacturers must turn to the best practices for designing composites. HyperSizer software, for example, is a composite optimization and structural sizing tool that works out-of-the-box with a wide variety of finite-element analysis (FEA) solvers. The tool couples with FEA in a feedback loop, searching for solutions that minimize weight while at the same time maximizing structural integrity and manufacturability. The software analyzes complex composite structures (it works with metals and other materials as well) by quickly evaluating designs in a ply-by-ply, and even finite element-by-element, manner. Optimizing all possible permutations for a composite laminate design gives engineers control of most every design detail. HyperSizer software performs panel swaps to find one that best meets the design criteria for a particular region of the blade. Design improvements to windpower turbine blades should increase their efficiency and performance, trim the cost of harvesting the wind, and keep it competitive with fossil fuels. To increase the power generating capacity of a turbine, blades must grow in length (power captured by a turbine is proportional to the square of blade length). As they grow, blades must be kept as light as possible. Lighter weight means better performance, longer life, lower manufacturing costs, and shortened manufacturing cycles, all factors that enhance competitiveness in energy markets. With a legacy in aerospace, the software has helped users such as NASA, Lockheed Martin, Boeing, and Bombardier, trim at least 20% of the weight from structures. The same can be true for wind-turbine blades. Current utility-scale turbines are equipped with blades that range from 40 m (130 ft) to 90-m (300 ft) diameters. But there are prototype and concept blades on drawing boards that approach a staggering 145-m (475 ft) diameters. 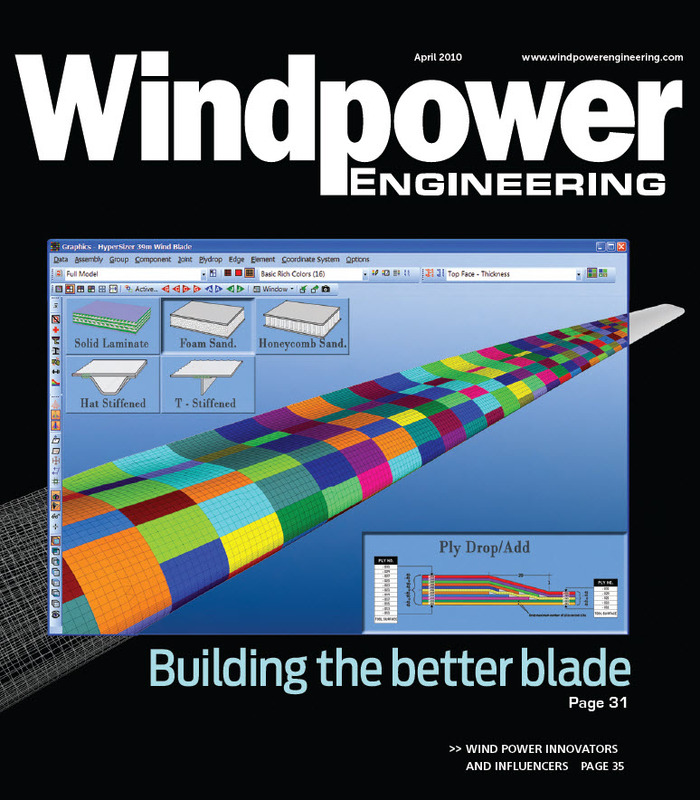 Design engineering issues such as structural strength, fatigue performance, buckling stability, blade stiffness, wing-tip deflection, and twist limits become increasingly important as turbine blades get longer. In simple terms, a blade must be as light as possible but stiff enough to maintain its aerodynamic shape and durable enough to carry wind loads without material failure. Furthermore, large blades must have a proper distribution of weight and stiffness to avoid instabilities produced by aeroelastic loads. To optimize a blade’s design, the software begins where traditional FEA ends. Starting with a finite-element model and coupling seamlessly with FEA solvers, the software verifies structural integrity, predicts failure modes for all aeroelastic load cases, and identifies failure locations and loads, thereby achieving required safety factors. To resolve unacceptable safety factors, or simply to find a lighter weight design, it sizes (optimizes) a design by surveying millions of design-candidate dimensions and laminates. Setup, run time, and interpretation of results and initial redesign are typically accomplished in as little as four hours. Minimizing ply drops cuts costs by improving a blade’s manufacturability and fatigue life. To evaluate what-if scenarios, trade studies, and sensitivities of a blade design, the software takes internal unit loads computed by FEA and determines an optimal combination of panel-and-beam concepts, cross-sectional dimensions, materials, and layups. To do so, it analyzes hundreds of different failure modes, achieving positive margins of safety (safety factor =1) for all analyses, all blade areas, and all load cases. The software also does panel trades. For example, a honeycomb or foam sandwich might be good for the shear web while a solid laminate might work best on a blade’s leading edge. The software can examine different layup stacks, as well as panel cross-section shapes. The software eliminates manual calculations, offline spreadsheets, model re-meshing, and long running batch jobs. It also evaluates ply drop-off and ply-add patterns to help find the lightest laminate that meets strength requirements and with the fewest transitional regions. HyperSizer includes features to evaluate blade areas with bolts (between blade sections) and adhesive joints (between the shear web and skin, for example). Analyses of bolt areas can prevent the common problem of overbuilding with heavier construction by optimizing padup thickness. Advanced analysis of adhesive joints looks at interlaminar shear and peel stress, delamination, and crack initiation. HyperSizer can start with a finite element model and redefine the colored zones of laminate thickness. It then works with a wide range of FEA software to calculate loads which are used in its optimizing routines. A built-in library of materials can manage temperature and moisture-dependent properties, and can be customized with proprietary company and project data. The database includes metallics (isotropics), graphite and glass-fiber systems, sandwich cores (honeycomb, foam, syntactic), and hybrid laminates (plies of tape, fabric, and metallic foil). This extensive material list lets users analyze over 100 non-FEA based failure modes for all load cases. In addition, Sandia National Laboratories’ MSU/DOE Fatigue Database with 10,000 results on about 150 materials, can be imported to provide further capability. In one application of the software, by NASA, it was the preliminary and final design tool (for flight certification) for projects such as the Ares V rocket and the astronaut’s composite crew module. The economic and political climate is primed for growth in windpower, but turbine performance, blade design, advanced materials, and quality in the field must reach the highest standards to help propel the industry forward. HyperSizer, with its composite analysis capabilities, has delivered great value to the aerospace industry and is ready to provide the same design assistance to the wind industry. It’s time for the wind industry to share in the benefits of the aerospace community’s accumulated expertise, without having to reinvent a composite wheel.